So far, why no mention of Architecture? That is because the pursuit of architectural quality in the estate was hardly an issue until 1950. Some of the buildings that had been bought, like Paris, or leased, like Moscow, or built by private architects, like Washington, were undoubtedly fine pieces of architecture, and were treated with respect. Many of the others were on the ordinary side, mainly because a building’s architecture was a lesser priority than its location, size, cost and availability. On top of that, the Office of Works had never given high priority to the design of new buildings overseas, preferring to use its own in-house architects, whose output was almost always competent but almost never uplifting. Architecture per se came more to the fore during the late 1950s. Both the Royal Fine Art Commission and the Architectural Review, edited by the formidable JM Richards since 1937, piled pressure on the Ministry of Works to increase the architectural quality of its output, and forced it to commission some designs from distinguished private architects. The early results were mixed. 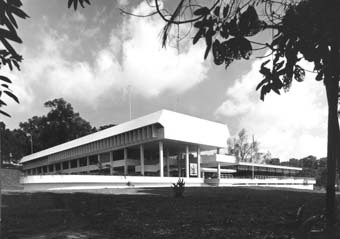 The Lagos High Commissioner’s residence (33), by Lionel Brett, completed in 1961, was adored by the architectural elite but hated by its occupants; Brasilia, by Peter and Alison Smithson was so off-beam and expensive that its design was aborted in 1967. And Rome, by Basil Spence, designed in 1960 (34) but not completed until 1971, was splendid in its way but operationally slightly outmoded from the day that it opened. On the other hand, the site was originally designated as green space and only Spence had the standing and force of character before the Rome Planning Board to get that designation altered to accept his fine building. 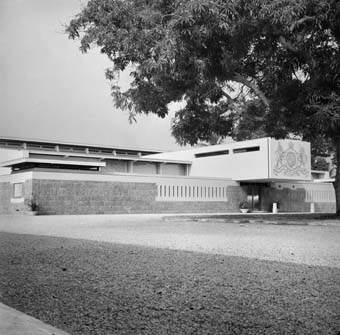 Despite these setbacks, the drive to seek better architecture than its standard in-house fare gradually forced the Ministry of Public Building and Works and Property Services Agency (as the Ministry of Works progressively became) to raise its own architectural game, as in such schemes as Islamabad, Manila residence and Singapore offices, completed in 1973 (35). FCO assumed responsibility for the diplomatic estate in 1983. PSA ran out of steam (and the government of money) in the 1970s. Margaret Thatcher was determined to dismantle the PSA, and the Foreign and Commonwealth Office was the first Government Department, in 1983, to be given control of the accommodation that it occupied. It set up an Overseas Estate Department, comprising ex-PSA professional and technical staff and diplomatic staff, with the objective of making the estate more responsive to the operational requirements of Posts. By then, there were approaching 4,000 UK-based staff serving overseas (and about 6,000 locally engaged staff). The estate, including all the staff residential accommodation, comprised about 4,500 properties, about one third of them freehold. OED began, in particular, an extensive estate rationalisation programme, tackling the backlog from the 1970s, and instituting architectural competitions for many of its major new buildings. 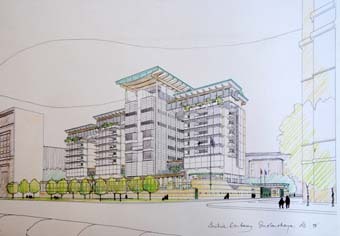 Just two examples were Dublin offices (36) and Muscat residence (37), both completed in 1995. Three large buildings brought the 20th century to a close, each brought about by that most reliable impetus for a new embassy building – a significant geo-political shift. Hence, Hong Kong Consulate General, with the establishment of the Special Administrative Region, designed by Terry Farrell and completed in 1997 (38); Berlin, with the re-unification of Germany, designed by Michael Wilford and completed in 2000 (39); and Moscow, with the ending of the Cold War, designed by Richard Burton and also completed in 2000 (40). 40. Moscow. Presentation sketch by Richard Burton. Three residential stacks flank the larger office stack. I won’t venture today beyond 2000. The estate and its buildings will go on evolving, including by diminishing and downsizing, and probably in some unexpected ways as well. So a final word about buildings that have left the estate. Some get demolished for redevelopment, but most are put to another use. 41. Lagos. 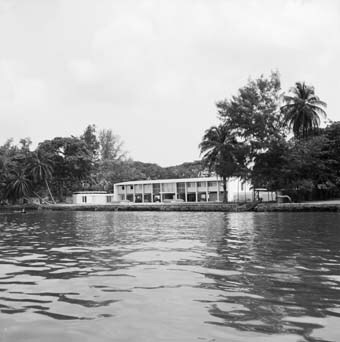 The residence entrance in the 1960s. 43. Lagos. 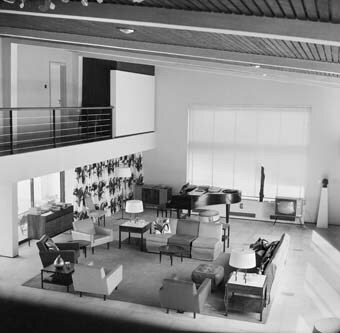 The residence drawing room in the 1960s. 45. Shanghai. The fairly ordinary consular residence of 1870. Some go down in the world, like Lagos (41, 42, 43, 44). And some go up in the world. Shanghai is a striking example. 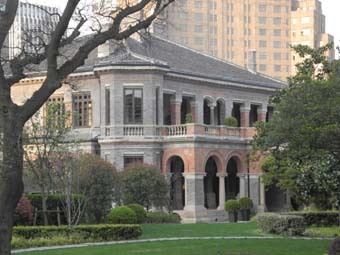 The fairly commonplace 1870 consular residence (45) on the Bund has recently been beautifully restored by Patek Phillipe as their foremost showroom in China. 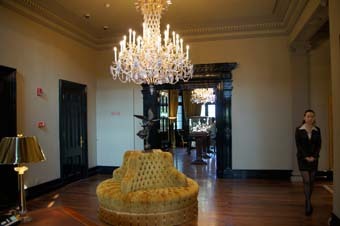 The Chinese are buying diamond-encrusted watches in the consul’s former dining room (46). How’s that for an evolutionary note on which to end? 33. Lagos. A sleek glazed box beside the Lagoon. 34. Rome. 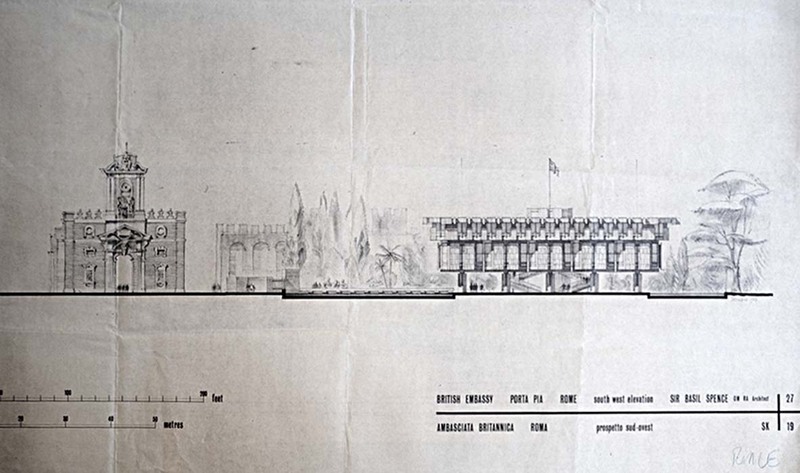 An early drawing by Spence, and showing his preoccupation with building so close to Michelangelo’s Porta Pia. 35. Singapore. Designed by one of the most gifted of all in-house architects, Ken Campbell. Beyond the pavilion at right, there is now a British Council building in similar vein. 36. Dublin. 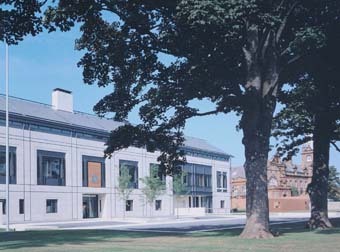 Offices, designed by Allies and Morrison,on a site bought from the Royal Dublin Society. 37. 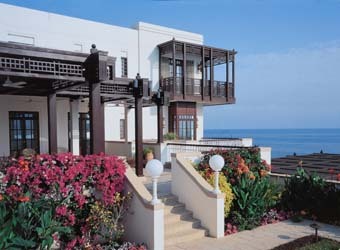 Muscat. On a rocky promontory just south of the city. Here, the guest room balcony. 42. Lagos. 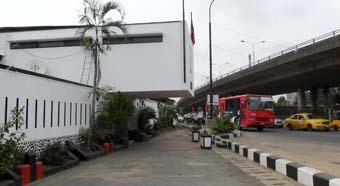 The Nigerian authorities compulsorily bought the residence so as to ease the route of a motorway. 44. Lagos. 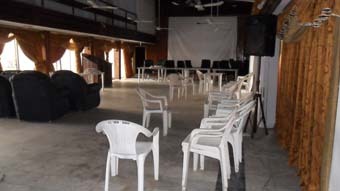 The Nigerian authorities compulsorily bought the residence and now use it as an officers’ mess. 46. Shanghai. The consular dining room is straight ahead.